JERUSALEM (JTA) — A surge in bloodshed over the past few days has pushed the battle in the Gaza Strip into a new phase, with Hamas militants expanding their attacks on Israel to include a sizable city and Israel responding with a military operation in Gaza. Though the Israel Defense Forces ended its limited operation Monday, Palestinian rocket fire from the territory continued this week and Prime Minister Ehud Olmert made clear he would not hesitate to strike at Gaza again to stem the fire. The paroxysm of violence has brought new challenges to Israel’s strategy of containing violence from the Gaza Strip while maintaining peace negotiations with the Palestinian Authority. After declaring Sunday that peace talks with Israel were off due to Israeli “aggression,” P.A. President Mahmoud Abbas offered Monday to negotiate a cease-fire between Hamas and Israel. Olmert rejected the idea of a cease-fire and said Israel would continue to engage in negotiations with the Abbas-led Palestinian Authority while striking at terrorists in Gaza. Foreign Minister Tzipi Livni said Tuesday that Israel might be forced to reoccupy the Gaza Strip. During a visit to the region Tuesday, U.S. Secretary of State Condoleezza Rice urged the Palestinian Authority and Israel to resume peace talks. Israel launched its operation after Hamas rocket crews in Gaza fired several Katyusha-type rockets into Ashkelon, a coastal Israeli city of 120,000. Two Israeli soldiers and more than 100 Palestinians, including numerous civilians, were killed during the raid. The high death toll prompted condemnation from the European Union and the United Nations secretary-general. 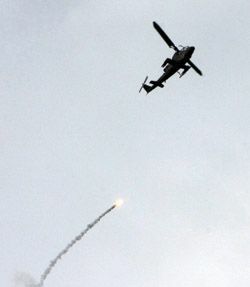 The latest surge in fighting began when Hamas fired dozens of rockets at Israel late last week after the Israeli Air Force bombed a van carrying five Hamas militiamen who recently had returned to Gaza after undergoing specialized military training in Iran. The Hamas rocket attacks claimed their first fatality in nine months: a 47-year-old father of four who was undergoing job training at Sderot’s Sapir College after recovering from a kidney transplant. The fatality in Sderot and the Katyusha attacks on Ashkelon prompted Israeli politicians to call for a massive military operation in Gaza to counter what they described as Hamas’ escalation of the conflict. The Katyushas, which have a longer range than the homemade Kassams regularly fired at Sderot, likely were brought into Gaza when the border between the Palestinian territory and Egypt was breached several weeks ago. After Olmert returned from a trip to Japan, Israel stepped up its attacks in Gaza, increasing its airstrikes, flattening the Hamas-run Interior Ministry and sending Israeli ground troops into areas of eastern Gaza City. The operation concluded Monday, and Palestinian militants fired more rockets into Ashkelon after Israeli troops withdrew. No one was reported hurt. Israeli officials described the crackdown in Gaza as a “war” but said a full-scale invasion of the strip was still a way off. The objective, it seemed, was to kill or capture as many Hamas rocket crewmen as possible and perhaps target the Islamist group’s leadership as well. “The ultimate objective is to bring an end to the firing of Kassams,” Defense Minister Ehud Barak said. Though Israel said most of the Palestinian casualties were combatants, the dead included many children and other civilians, and television images of the violence drew censure in the Arab world and beyond. A Dubai news anchor wept during a live report on the burial of a Gazan baby. Angry Palestinians in the West Bank clashed with Israeli troops. Though the Abbas administration stopped short of declaring dead the peace process revived at the U.S.-led peace conference last November in Annapolis, Md., the P.A. president irked Israelis by saying in broadcast remarks that what was happening in Gaza was a “worse holocaust” than what befell the Jews in World War II. Some Israelis have suggested that toppling Gaza’s Hamas regime might be a perfect opportunity to hand the territory back to Abbas, whose Fatah forces were routed from Gaza last June by Hamas militants who wrested control of the strip. Israeli analysts cited this theory in explaining Abbas’ sudden bouts of anti-Israel rhetoric. “Abu Mazen cannot afford for Palestinians to think he is riding back into Gaza on the backs of Israeli tanks,” Tzvi Yehezkeli of Israel’s Channel 10 news said, using Abbas’ popular name. Last week, Abbas went so far as to suggest that violence might one day be the way for Palestinians to achieve statehood. Palestinians, including Hamas, generally use the terms “struggle” and “resistance” for any type of attack against Israelis whether they are soldiers or civilians. On and off since Israel’s withdrawal from the Gaza Strip in 2005, Israel has grappled with how to contain violence from the strip. Despite calls by opposition politicians for a major ground assault in Gaza, Jerusalem officials privately say Olmert is reticent to launch a wide-scale operation in Gaza with no clear exit strategy or effective means of halting the incessant rocket fire on Israeli communities. Other Israeli officials said the priority was keeping a lid on the Gaza crisis. There was some speculation that Egypt could be asked to broker some kind of unofficial cease-fire with Hamas. But the Egyptians, still reeling from the blow their security and prestige suffered several weeks ago when Hamas breached Gaza’s border with the Sinai, look reluctant to weigh in. Omar Suleiman, an Egyptian spymaster who was scheduled to fly to Israel this week for talks with the Olmert government and visiting U.S. Secretary of State Condoleezza Rice, postponed his trip indefinitely. Meanwhile, Olmert said the attacks on Hamas strengthen the chances for peace. Mahmoud Abbas signaled a readiness to resume peace talks. The Palestinian Authority president had suspended the talks in protest of Israel’s offensive in the Gaza Strip. “I call on the Israeli government to halt its aggression so that the necessary environment can be created to make negotiations succeed, for us and for them, and to reach the shores of peace in 2008,” Abbas said Tuesday following talks with U.S. Secretary of State Condoleezza Rice in Ramallah. “We have reaffirmed more than once that peace and negotiations are our strategic choice.” Rice, who arrived in Israel hours earlier and was due to leave Wednesday after meeting with Israeli Prime Minister Ehud Olmert and Foreign Minister Tzipi Livni, defined the objective of her trip as salvaging the peace process. Abbas suspended negotiations over the weekend at the height of an Israeli offensive against Hamas rocket crews in northern Gaza in which approximately 110 Palestinians were killed, including dozens of civilians. Olmert said Israel wanted to pursue diplomacy with Abbas in parallel to its crackdown on Hamas. It was not immediately clear from Abbas’ comments when he might agree to meet Olmert again.